As some of you might already have seen via Instagram or Facebook, after a few weeks of reminders, digs, sarcastic comments, nagging and a little begging…the Hubster finally got around to revamping my blogging space and I love it! I can handle most things in the home, but if it involves a screwdriver (or dirt, or spiders, or anything really really heavy) then I’m pretty much useless. So apologies to anyone who is all for women-doing-DIY-and-we-don’t-need-a-strong-pair-of-hands-and-all-that-jazz-well I do and I’m not ashamed to admit it. I do make an excellent assistant though. Tea, hoover, chit chat, I’m there to lend a helping hand…that is until I knock the Hubster on the head with the hoover or trip over his drill, at which point he usually asks me to leave the room. Hey Ho. I’m very much a neutral kind of person. I do like bright colours, but for the home I prefer more natural tones where subtle colours can be added here and there depending on the mood or season. With my little blogging desk kindly given to me by my brother (now I think about it, I never offered him any dosh for it- oops, sorry dude!) as I starting point, I’ve slowly begun to create a little corner of our home where I feel comfortable and inspired, surrounded but lots of lovely pretty things…such a girl (puke) I know. Like most, I’m a huge fan of everything from Next’s gorgeous home range. 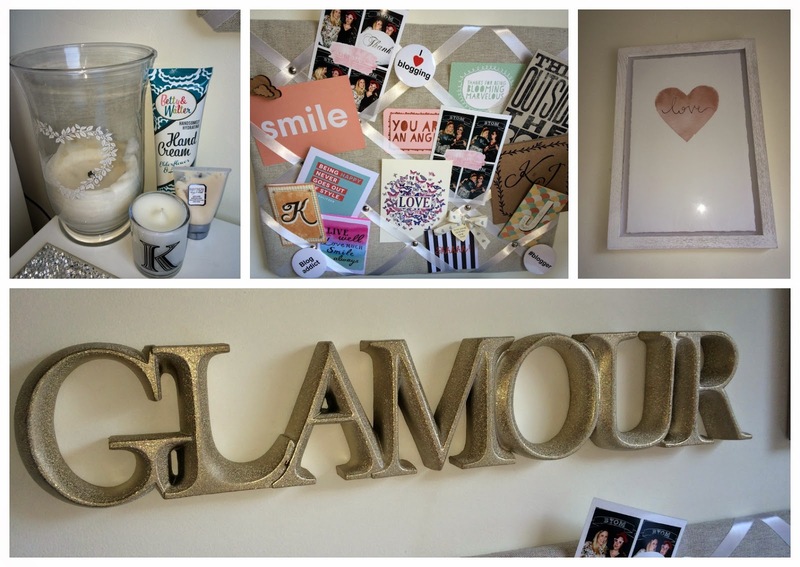 The lamp, silver hearts, along with the ‘Glamour’ sign and ‘Love’ frame were all purchased from Next earlier on in the year, but they have at great range of wall art here. I am so in love with my chair which I brought with my Christmas bonus- it is a Louis XV vintage inspired dining chair with a French script embroidered cover. I love it. The noticeboard is from Laura Ashley and I’ve started to build quite a collection of cute notes and bits from my blogging journey so far. How cute is the cloud pin from Tigerlilly Quin which was gifted to us at Blogtacular? I spent hours scouring the internet for shelves for our home and I absolutely love these classic old white shelves from Homebase. They are a little pricey, but they are really elegant and compliment my romantic feminine theme perfectly. 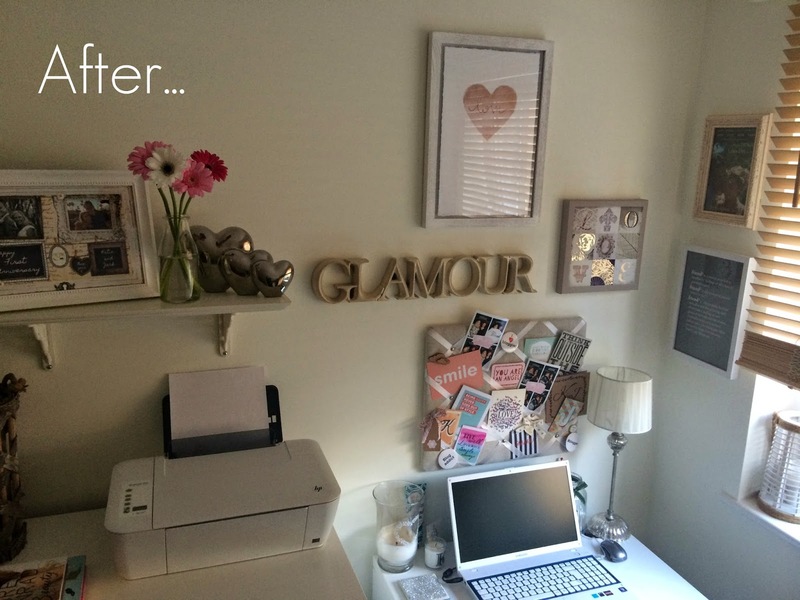 I’ve always been conscious that my work space has a huge impact on my ability to get the work done efficiently, whether this be teaching, planning weddings, or blogging. Even when I was a school I loved working in a bedroom that I was proud of which you can read all about here. Having a dedicated work space allows you to drive all your attention and focus on the tasks at hand in one area without dragging your work and stresses throughout the rest of your home. Thank you Hubster for putting everything together for me- I really appreciate it! Now about that hook I need putting up…can it be done before Christmas? 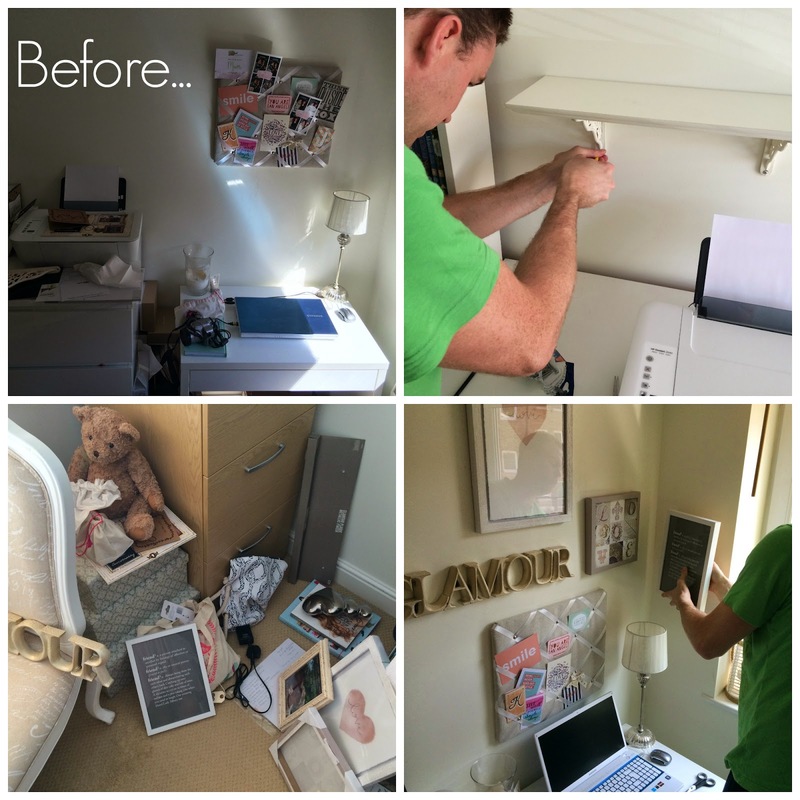 Spreading the blog love, I’m linking this post up with the fabulous Jen over at Love Chic Living as part of her brilliant #LoveYourHome linky!